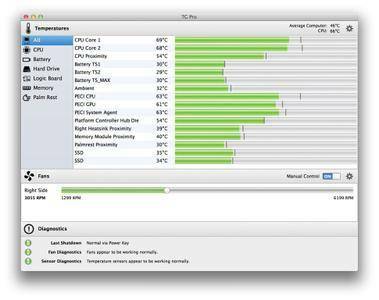 TG Pro will give you a look at what’s going on inside your Mac. No other app shows more temperature sensors or has as many options TG Profor notifications and fan speeds. Find out which components are getting hot (and potentially overheating), turn up the fan speeds to cool down your Mac, get notifications for temperature alerts along with many other fantastic features. Plus, see if any sensors or fans are defective with the built-in hardware diagnostics. See why thousands of people trust TG Pro as the go-to app for temperatures and fan control. 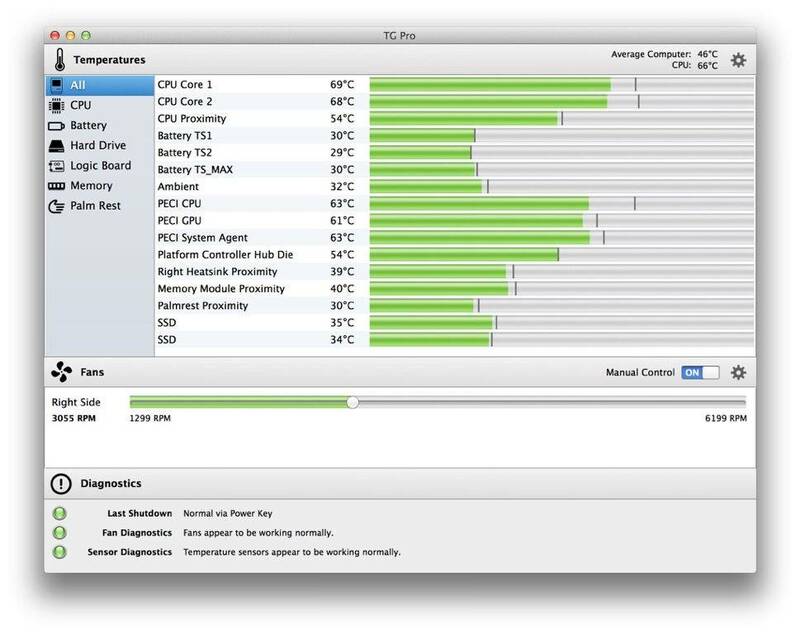 - See the current and maximum recorded temperatures (in Celsius or Fahrenheit) for every temperature sensor in your Mac. - View and control the speeds for every fan. With Auto Boost, have the fans go to a specific speed when a predefined temperature is hit. - Always available status icon menu includes all temperatures, fans and manual controls. - Show a notification if a sensor or the Mac gets too hot, or when the fans are turned up with Auto Boost. - Monitor remote servers by having an email sent instead of a local notification. - Discover faulty fans, temperature sensors and batteries with the built-in diagnostics. - Log all temperatures, fan speeds, diagnostics and notifications to a CSV file. - Run in the background with configurable info displayed in the menu bar. - Fix iMac fan noise after HD replacement. See how using TG Pro. - Supports all Macs, including the Mac Pro 2013 model as well as all MacBook Pros (including 2015 & 2016 models), iMacs, Mac Minis, MacBook Airs and older Mac Pros.